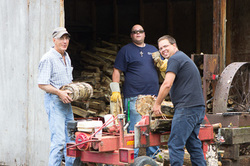 OLVC relies on the generosity of many men and women who volunteer to help as cooks, nurses and with maintenance at our youth retreat weekends and during our summer programs. No special skills are required to volunteer in the kitchen or with maintenance. An orientation and supervision/direction is provided by staff for those helping in the kitchen and with maintenance. In order to ensure that OLVC is a safe place for our participants, staff and volunteers are required screening procedures PRIOR to volunteering at camp: see the New Volunteer button below for details. With the support of our Kitchen Coordinator and assistant cook, 6-9 volunteers are needed to assist with the preparation of three meals and one snack per day for our participants and staff. No experience is necessary. The meals are planned and groceries purchased by staff. The help provided by volunteer cooks makes the work easier and creates an enjoyable community of service. 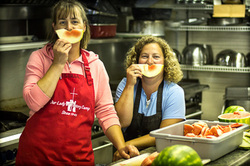 Many cooks come back year after year as they have made their own “camp friends” in the kitchen! One or two nurses or doctors are needed each week and at our weekend youth events. Nurses should be registered nurses in good standing, doctors, licenced practical nurses or 3rd year nursing students who have successfully completed their course for the proper distribution and documentation of medications. One or two volunteers per week or weekend event help our maintenance supervisor with yard work, maintenance and special projects around camp. Trades experience is always welcome and needed. All help is a gift and there is always a long list of little projects that maintenance volunteers help with! ​If you have any questions or need help with your application or paperwork please contact the camp office @ (403) 986-6582 or info@olvc.ab.ca. We are happy to help!